On a very hot and sunny day, the Headstone Rededication and Commemoration of the Battle of Fromelles was held at Fromelles (Pheasant Wood) Military Cemetery. The Service on Thursday 19 July commenced at 6pm, exactly 102 years after the scheduled time that the 5th Australian Division and 61st British Division attacked the German lines. French Flag-bearers honour the Australian and British soldiers in the Battle of Fromelles. The Catafalque Party enters the Cemetery passing covered Headstones to be rededicated. Master of Ceremonies, Colonel Scott Clingan, Australian Defence Attache- Commemorations, Ms Jennifer Stephenson, First Secretary, Department of Veterans Affairs and Mayor Ms. Jean-Gabriel Masson welcomed dignitaries and guests. Colonel Scott Clingan is a descendant of Private Alexander Clingan KIA 19 July and buried in Section 3, Row E, Grave 8. Col. Clingan’s cousin, John Clingan delivered the Family Reflection at the Sydney Fromelles Day Commemoration a few hours earlier. After an Opening Prayer by Father Patrick Irwin and a Commemorative Address by the representative of the French Government, The Australian Ambassador to France, H. E. Brendan Berne gave his Commemorative Address, which is included with the Order of Service. Click here to see the Order of Service. Wreaths laid at the Cross of Sacrifice. The Headstone rededications followed for the 9 Australian Soldiers who fought in the Battle of Fromelles in France and were formally identified at the 2018 Fromelles Identification Board in April. Headstone Dedication Pte. J. Smith and Capt K Mortimer. Headstones Pte. J. Smith and Capt K Mortimer. Henry (known as Harry) Bell was featured in Seeking Harry Bell, posted 11 July 2008. This relates the many heart-felt letters from the Bell family seeking information about Harry . 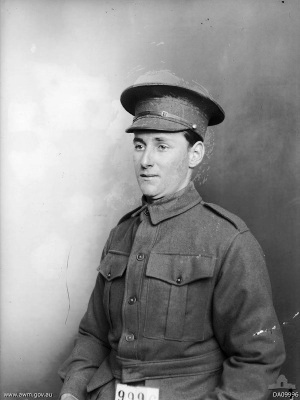 Harry Bell was a 39 year old insurance agent when he enlisted in the AIF on 8th July 1915 at Bendigo, in country Victoria. He was a prominent member of the Bendigo community having been the Secretary of the Bendigo Rose Society and a member of the organising committee for the Bendigo Egg Laying Competitions. Harry & Dorothy Bell were married shortly before his enlistment and embarkation aboard HMAT Ascanius from Melbourne in November 1915. A decade ago, the Families and Friends of the First AIF was advocating that the Australian Government through the Minister for Veterans’ Affairs should commit the to re-burial of the “missing of Fromelles” with individual graves and headstones in a new Commonwealth War Graves Commission Cemetery at Pheasant Wood after DNA testing. A decade later, it is pleasing that DNA testing has enabled Harry’s relatives to help his identity to be restored, along with many of his comrades and that Harry and his comrades has been honoured with a reburial with full military honours and individual headstones. [Click on images to enlarge]. Following the headstone rededications, The Ode was recited, The Lasat Post sounded, followed by a minute’s silence and the Rouse sounded. The National Anthems of France, Germany, The United Kingdom and Australia were played before a final prayer. The Flag Bearers and Official party then departed. Descendants and guests mingled throughout the cemetery, paying their respects to individual soldiers. As the sun set over the battlefield of 102 years ago and the war graves at Fromelles …. Thank you to Carole Laignel for her photographs and the copy of the Order of Service and for the welcome she gives to Australian visitors to Fromelles. This entry was posted in Fromelles. Bookmark the permalink.